Sift flour, measure and add salt. In a large bowl, beat egg yolks until thick and lemon colored. Add sugar gradually, continuing to beat. Add vinegar and flavoring; beat, then fold in flour slowly, until all absorbed. With clean beater, beat egg whites in separate bowl until they hold their shape. With large wooden spoon or spatula, fold egg yolk mixture into beaten whites, gently; do not beat. Bake in an ungreased tube pan (10-inch) at 320° for one hour. After baking, invert immediately. 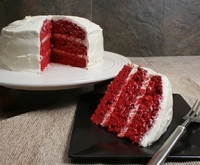 Recipe categories: Desserts, Cakes, Egg.